Just Eat's share price has fallen to a one-year low following reports that Uber is in early-stage talks to buy rival UK food delivery firm Deliveroo. Just Eat's shares fell 5.5% to 669.4p, the lowest since September last year. Bloomberg reported that Uber was in discussions to buy Deliveroo for several billion dollars. Uber declined to comment, while a Deliveroo spokesman said: "As a matter of policy we do not comment on speculation." Paul Hickman, an analyst at Edison Investment Research, said a combination of Uber Eats and Deliveroo could create "a killer brand". He said: "Uber has a comprehensive app-driven distribution system and an international reputation, while Deliveroo's business model encompasses ownership of the delivery function, unlike Just Eat which relies on restaurants' own delivery drivers." But Ian Whittaker, media analyst at Liberum, said investors in Just Eat should be reasonably comfortable even if Uber did buy Deliveroo. He said Just Eat had already grabbed a third of the UK food delivery market and "once you are a market leader and entrenched with customers, you are extremely hard to dislodge". 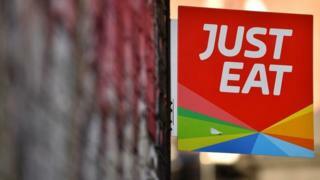 In addition, Just Eat is focused on "second tier" towns, Mt Whittaker said. "Nearly two thirds of Just Eat's customers in the UK, for example, are outside the 11 top cities where Uber and Deliveroo is naturally weaker than the big cities." A takeover of Deliveroo would fill gaps in Europe at Uber's food delivery operation. Earlier this year, Uber's chief executive Dara Khosrowshah claimed that its food delivery business was on course to be the largest food delivery business outside China. He told the Code Conference in California in May: "Eats is only in 250 cities on a global basis and it's got 350 cities to go to catch up to our rides business." Mr Khosrowshah has said that he wants to get food to Uber Eats customers within 5 to 30 minutes, and the company has been investigating using drones to get takeaways to consumers. A spokesman for Uber Eats said: "In response to feedback from couriers we've made some changes to our payment structure in London, which brings it into line with other cities. "The changes will help increase earnings during busy mealtimes and, as we transition to the new system, we're introducing minimum payment guarantees of £9-11 an hour."